Terriers as earth-dogs are very much a British creation, although pinschers and schnauzers, and especially the German Hunt Terrier, are terrier-type. 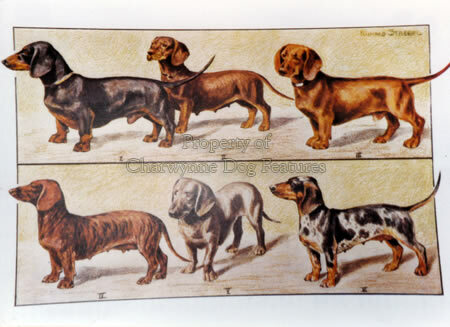 But the Dachshund, classified by the Kennel Club as a hound, (perhaps mistakenly believing 'hund' to be our word 'hound' whereas it means dog; the German word for hound is bracke), in its working role or Teckel use, is very terrier in function. 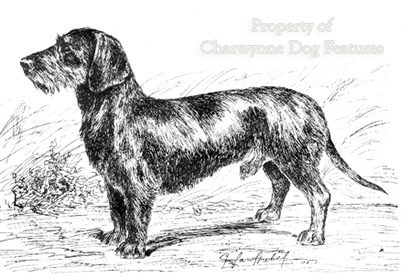 Mu ch is made in show dog histories of the Dachshund of clandestine terrier blood infusions, especially the Dandie Dinmont contribution, but I can find no proven use of terrier blood in the creation of the Dachshund. The development of the wire-hair was aided in 1925 from Dandie blood by Lt Klaus Graf Hahn of Potsdam. But the centre of working use was the Harz mountains where Dachswurgers (badger-destroyers) were treasured and reference to a Lockhundlein or little decoy dog intriguingly made. What is far more compelling is a descent from German foothounds, like the Dachsbracke. 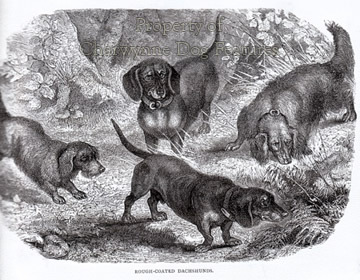 In the early 1800s, a Prussian forester called von Daacke was increasing the Dachshund's scenting ability by outcrossing to his Hanoverian Schweisshunds, producing red dogs with black masks and an eel stripe along their backs. 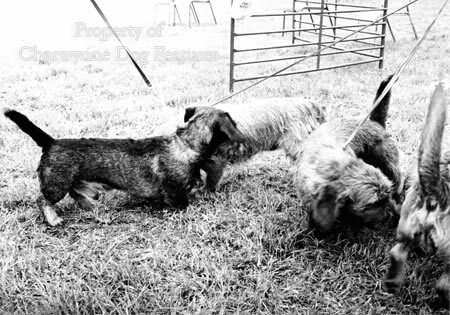 Small foothounds were favourite sporting dogs in western and central Europe in past centuries: the Drever in Sweden, the Stee nbrak in Holland, the Sauerland Hound or Steinbracke, as well as the Dachsbracke, in Germany and the Jura Niederlaufhund in Switzerland. There is a variety called the Alpine Dachsbracke, found in the Erzgebirge Mountains near the Czech border, known locally as the 'Erzgebirgler', usually in a rich tan. 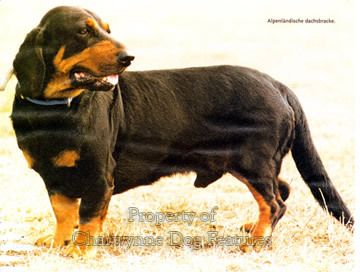 Most of the Swiss hound breeds have a smaller shorter-legged niederlaufhund variety, illustrating the genetic tendency in these foothounds. Our English Basset, bred by the packs and the result of a Harrier outcross, is our equivalent hunting hound. 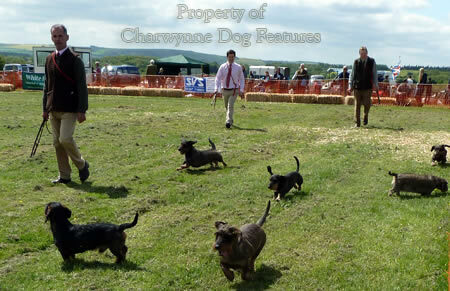 As the Basset Hound demonstrates, these small hounds can throw crooked-legged dwarf offspring, with the show ring favouring the latter and sportsmen going for the straight-legged variety. 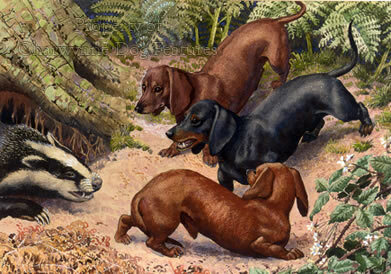 The Dachsbracke, or Badger Hound, represents the latter, the Dachshund or Badger Dog representing the former. Crooked-legged dwarfism is a genetic freak, an abnormality called achondroplasia, inherited recessively. 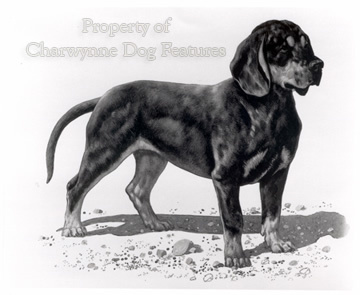 As breed depictions indicate down the years, such a genetic sidetrack in time exaggerates itself, leading to the harmful elongated backs and the disabling legs of the show ring specimens. In the Dachsh und front, the whole forehand structure is reduced in length of bones; the elbow action arc being actually above the brisket line. Not surprisingly, Dachshunds and say a sighthound breed such as the Saluki move very differently from each other. 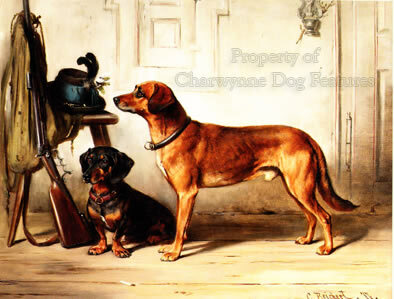 Dachshunds are the only breed with the shoulders positioned so high above the brisket or keel, as breed fanciers like to term it. The Dachshund is predisposed to intervertebral disc disease because of its conformation, with disc disease occurring in young dogs as well as a geriatric condition. Described in its sporting past as a Dachskrieger or Badger-warrior, with the lower to ground specimens called Dachskriecher or Badger-creeper, any Dachshund would have to be some dog, physically and in spirit to tackle a badger. Every earth-dog needs remarkable agility to work underground, both to manoeuvre and to dig. The anatomy of the show ring specimens would preclude such activity alone. 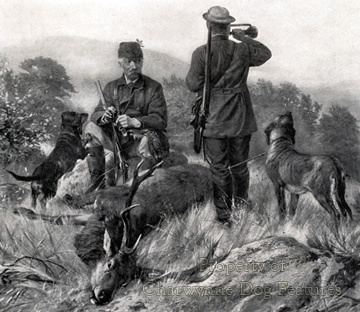 Hunt terriers tend to be 12 to 14 inches at the shoulder and weigh around 14lbs, because that is what enables their function. The ideal weight for a Dachshund is 20-26lbs, with the miniature varieties being 10lbs; not much for badgers to fear there! For a 10lb dog, practically legless and with an exaggerated weakened spine, to be called a 'badger-dog' is absurd. 'Badger-breakfast' would be more accurate!